This summer, Pope Francis plans to release an encyclical letter in which he will address environmental issues, and very likely climate change. His statement will have a profound impact on the public debate. For one, it will elevate the spiritual, moral and religious dimensions of the issue. Calling on people to protect the global climate because it is sacred, both for its own God-given value and for the life and dignity of all humankind, not just the affluent few, will create far more personal commitment than a government call for action on economic grounds or an activist’s call on environmental grounds. Making a case on theological grounds builds on long-standing arguments in the Catholic catechism that environmental degradation is a violation of the seventh commandment (Thou shalt not steal) as it involves theft from future generations and the poor. Against such a moral backdrop, the very call to “make the business case to protect the global climate” – a common tactic to argue for action on climate change – seems rather absurd. The pope’s statement will shift the tenor of the public and political conversation in needed ways. But perhaps even more important than the content of the message is the messenger: the pope. The public debate over climate change today has been caught up in the so-called “culture wars.” The debate is less about carbon dioxide and greenhouse gas models than it is about opposing values and worldviews. In the United States, those opposing cultural worldviews map onto our partisan political system – the majority of liberal Democrats believe in climate change, the majority of conservative Republicans do not. People of either party give greater weight to evidence and arguments that support pre-existing beliefs and expend disproportionate energy trying to refute views or arguments that are contrary to those beliefs. Further, research shows that we have begun to identify members of our political tribes based on their position on climate change. We openly consider evidence when it is accepted or ideally presented by sources that represent our cultural community, and we dismiss information that is advocated by sources that represent groups whose values we reject. The pope, by contrast, can reach segments that the three primary messengers on climate change – environmentalists, Democratic politicians and scientists – cannot. First, the pope can reach the world’s 1.2 billion Roman Catholics with an unmatched power to convince and motivate. Religion, unlike any other institutional force in society, has the power to directly influence our values and beliefs. 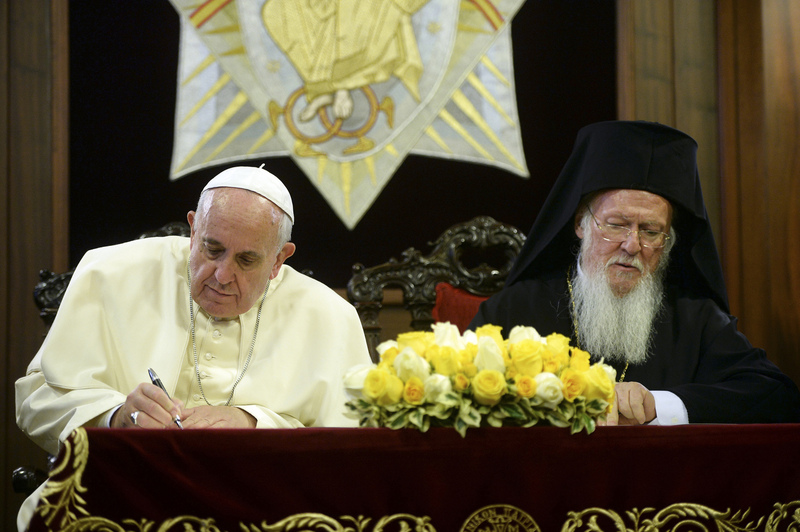 The Pope may have an ally in Patriarch Bartholomew I, the so-called ‘Green Patriarch’ of the Greek Orthodox Church. Government regulations can influence behavior, but often without changing underlying values and motivations. But by connecting climate change to spiritual and religious values, and introducing notions of sin, people will have new and more powerful motivations to act. The pope can make the issue as personal as Sunday School. Once the pope’s message is out, Catholics will hear that message reinforced in homilies in their home parish. And it would appear that Catholics are a receptive audience. According to a survey by the Yale Project on Climate Communication, a solid majority of Catholics (70%) think that global warming is happening and 48% think it is caused by humans, compared with only 57% and 35% of non-Catholic Christians respectively. But the pope’s reach extends far beyond his Catholic followers. A survey by the Pew Research Center found that the pope is extremely popular with both Catholics and non-Catholics. Americans are particularly fond of Pope Francis, with more than three-quarters (78%) giving him positive marks. In Europe, Catholics and non-Catholics view the pope with very similar acclaim. His message will undoubtedly reach beyond the Catholics of the world, and has the potential to draw attention to the ongoing efforts of leaders in other denominations, including Ecumenical Patriarch Bartholomew I of the Orthodox Church, nicknamed the “Green Patriarch”). With the pope taking a stand on climate change, it could compel other religious leaders to make more public calls for action. If the message of climate change is delivered more from the church, synagogue, mosque or temple, people will internalize it as a moral issue that compels them to act regardless of the “business case.” A change in the tenor of the public debate in America will set the stage for leaders of all faiths to step forward. This all leads to potential change within our political system. The 114th Congress has 138 Catholic Congressman (70 of whom are Republican) and 26 Catholic Senators (11 of whom are Republicans). Those 81 Republicans have followed the party lead in rejecting the scientific consensus on climate change, not because of the scientific evidence, but rather by yielding to party politics. But this may be changing. This past January, 50 Senators, including 15 Republicans, voted on an amendment that affirmed that humans contribute to global warming. Other Republicans have begun to chip away at what former Utah Governor Jon Huntsman called, the party’s “anti-science” position that flies in the face of the assessments of over 200 scientific agencies around the world, including the scientific agencies of every one of the G8 countries. The pope’s message could give political cover for emerging Republicans to upend the notion that you can’t be a conservative and believe in climate change. They could undertake this conversion as a personal reexamination of their beliefs or as an answer to a reenergized base. A recent poll found that two-thirds of Americans said they were more likely to vote for political candidates who campaigned on fighting climate change (including 48% of Republicans) and less likely to vote for candidates who denied the science that determined that humans caused global warming. A newly non-partisan dialogue in Congress can lead to action on multiple fronts. It could hinder repeated threats by the GOP, and most recently by Republican Senate Majority Leader Mitch McConnell, to defund the Environmental Protection Agency’s climate program to reduce greenhouse gas emissions. It might also influence the Supreme Court as it considers the case against the EPA (six of nine Justices are Roman Catholic). It may shift the US position on climate change in advance of the upcoming United Nations Framework Convention on climate change in Paris. Finally, it may help shift the views of presidential candidates, such as Marco Rubio, and elevate climate change on the list of election issues for both parties. According to a Gallup poll, 61% of Democrats view climate change as important, compared with only 19% of Republicans, ranking it dead last on the list of GOP priorities. In the end, the best possible outcome of the pope’s message for Americans is a breakdown of the partisan divide over climate change and a reestablishment of societal trust in our scientific institutions. On the one side, Democrats may learn a powerful lesson about the need to go beyond the scientific arguments on the issue and begin to connect it to people’s underlying values, which could help motivate action across the political spectrum. You know, when it comes to climate change being real, people of my party are all over the board… I think the Republican Party has to do some soul searching. Before we can be bipartisan, we’ve got to figure out where we are as a party… What is the environmental platform of the Republican Party? I don’t know, either. Let’s hope that the pope, in concert with other religious leaders around the world, can help them figure that out. a lot of religions have their roots in nature or weather,etc you would think that more would actively be involved with the environmentalist movement as well as their own respective religions.